Only a few drivers are lucky enough to avoid car accidents. There are many different reasons for these accidents, regardless of whose fault it is. At first sight, all accidents have their own nature, except for one common thing—all of them are unexpected, except perhaps the cases involving drunk drivers. Driving under the influence is considered being reckless, and it illustrates that a person idealizes his or her driving abilities. This approach does not allow us to predict the accidents with a tragic outcome. We offer you another approach for foreseeing accidents, if you remember that everything in this world happens for a reason. As you understand, an accident is a way of destroying a driver’s mistaken beliefs. The first mistaken belief is the idealization of one’s abilities. We idealize our abilities if we prefer driving fast, passing other drivers by any means. This idealization manifests itself in a feeling of superiority over other drivers and disdain for their driving. Of course, we have similar attitude toward other people in other aspects of life, including work, but at the moment, we are considering only driving. In reality, you have no reason for such judgment. No matter how fast and recklessly you drive, there is always someone who can be even more reckless. You should not despise careful drivers either. You have no idea who drives other cars. It can be a priest, a college professor, or a world boxing champion who might have his own reasons to disdain you, and in case of a conflict, he will certainly be able to defend himself. Your Guardian notices your false beliefs, and as soon as your SA becomes full, he starts teaching you lessons. With the help of some adequate measures, he proves to you that you do not drive so well after all. At some point, he makes you absent-minded, and you become involved in an accident. Life is merciful, so the lessons gradually become stricter according to the number of your negative thoughts and emotions you accumulate. Initially, fast drivers become involved in small accidents. If they do not learn the lesson, then harsher measures are applied. When the total number of negative convictions exceeds the norm, your physical life is taken away. You may say, “So what? Does it mean I should not drive fast anymore?” Yes, you may drive fast! Yet, you should not despise others for driving slower and more carefully than you do. Change your values. Sympathize with other drivers, who are less able according to you. Apologize to them in your thoughts for your impatience and for your need to pass them on the road. It does not seem to be a big deal; however, this attitude may save you a lot of time and money that you might otherwise need to spend on repairs and medical treatment. Another common mistake is to idealize material goods—in this case, a vehicle. For some people, having a prestigious car as a possession becomes their main goal in life; it is stereotypical evidence of prosperity and happiness. This idealization leads to two kinds of erroneous beliefs. If you have a very nice car, you might start to feel superiority and contempt toward others who have a worse vehicle or no car at all, i.e., you exaggerate your invincibility and despise others, developing an arrogant attitude. You allow yourself to despise others simply because they do not have such an impressive gadget as you do. To help you get rid of this misconception, your Guardian may take measures to humble your arrogance and disdain for others by the means of making it more difficult for you to repair your car after an accident. It does not matter whether you or another driver is at fault. Your Guardians had agreed to involve the two of you in thisaccident to teach you both a lesson. If you just go and repair your car without changing your attitude, the very object of your idealization may be taken away from you. Your Guardian may work it out with the Guardian of a thief who is destined to steal your car to deprive you of the original reason of your idealization—your car. So, it turns out that this very accident had been subconsciously provoked by your own attitude. At the same time, you may experience difficulties acquiring a new automobile or when dealing with your insurance company, which may question the adequacy of your driving abilities. On the other hand, if you do not idealize your car, regardless of its splendor, nothing will happen to it. There is no reason for a future car thief to teach you any lessons. The second idealization occurs when you have no car at all or if you are unhappy with the one you have and cannot afford to purchase a better one. You admire luxury cars and either secretly hate their owners or believe that you are unlucky in life. In his way, you idealize wealth and material success and condemn your present inadequate state. To change your erroneous beliefs, your Guardian will take measures to worsen your financial situation, which compared to your previous one will seem quite a disaster. Then you will understand that you should have appreciated your situation and should not have condemned Life. It is a normal desire to have a luxurious car; however, do not take offense with Life if something does not turn out the way you want and if your financial situation is worse than that of other people, which does not allow you to buy a better vehicle. If you think about it, you will realize that you are responsible for your poverty, but if you continue being discontented about your financial state, Life will keep teaching you lessons until you become very poor, get sick, or even die. For your Guardian, the purity of your soul is much more important than your obsession with material wealth. speed, or forcing others to pass us on the wrong lane. Alternatively, we may simply become angry inside without showing it. In any case, our Guardian discerns this idealization and takes the necessary measures—namely, trying to mend our disposition concerning discipline: He will make us encounter a lot of lousy drivers who will force us to break all possible rules or get into an accident and hold us responsible for it. Thus, he will continue teaching us until we stop being obsessed with order and discipline. This explanation does not mean that our Guardian dislikes discipline. He simply does not care much about the behavioral patterns established by people. Instead, our Guardian is concerned cleansing our soul and does not want us to become bitter or contemptuous. Certainly, drivers are not the only ones with erroneous beliefs. Business people, politicians, scientists, artists, and other people have them, as well. We all belong to some professional environment and sometimes experience the peer pressure. We showed you how to consider all of the events in our life from the following point of view: If something happened, it means we received a lesson and must learn it. We should determine what Life is teaching us and correct our mistakes. Life is life, and we are not able to change it. We may only learn to understand its laws and try to follow them in our life. Life constantly monitors our thoughts and actions. We permanently receive instructions within the norms of behavior that Life establishes. We may do whatever we want; however, we should not attach excessive importance to any idea, event, person, or feeling. Family life is one of the most effective areas where Life can destroy our idealizations. Couples who marry for love usually idealize different values. As a result, they teach each other lessons, and it becomes one of the primary reasons for family conflicts. Children usually idealize values that are opposed to the values of one of their parents. This way, parents and children teach each other lessons and eradicate each other’s idealizations. 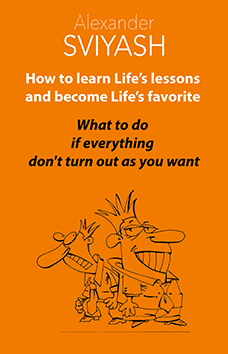 Failures at work and an inability to fulfill our plans are good signs that we are being taught lessons by Life. In these situations, we need to change our attitude toward our goals and our other idealizations, and then these situations will improve.